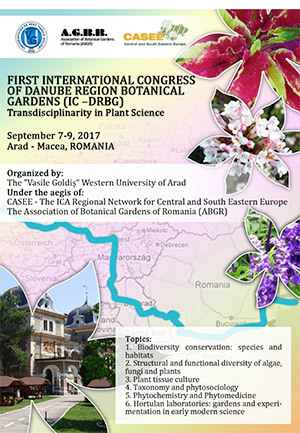 On behalf of the Vasile Goldis Western University of Arad, we invite you to participate at the FIRST INTERNATIONAL CONGRESS OF DANUBE REGION BOTANICAL GARDENS: Transdisciplinarity in Plant Science, to be held in Arad, during September 7-9, 2017. The aim of the First International Congress of Danube Region Botanical Gardens is to offer a forum for Central and Eastern European academics in the field of plant science research. The Scientific Committee is preparing an exciting program, with six parallel thematic sessions and a poster session, offering a wide range of opportunities to enhance and enrich the professional experience. 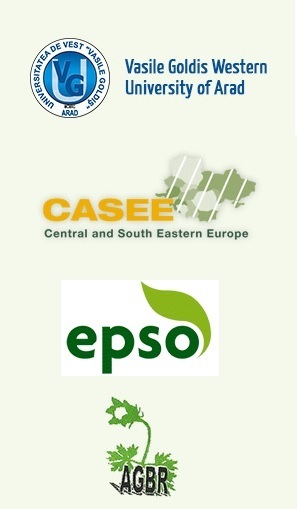 In addition to the attractive scientific program, the congress venue offers an attractive visit to the “Pavel Covaci” Botanical Garden of Macea and a Romanian folk concert at Macea Castle, as well as a barbecue dinner, bringing together the academic communities of the Danube Euroregion. The “Pavel Covaci” Botanical Garden of Macea has a 21.5 hectares and a collection of over 3800 taxa, of which 2100 wood taxa. The Botanical Garden also has a Botanical Museum and a Seeds’ Collection, a Hunting Museum and an Ethnographic Museum. The garden has constant exchanges of biological material with over 250 botanical gardens and arboretums worldwide and houses one of the oldest herbariums in Romania: by L. Simonkai (1860-1890). Arad is a European multicultural town, established in the 11th Century, which enjoyed a great economic development in the 19th century. In 1834 it was declared a “free royal town” by the Emperor Francis I of Austria. We welcome you to discover more about Arad and its friendly atmosphere, crowning-town history and excellent food and wines. Let’s meet in Arad in 2017 – your presence will be a key part of the meeting’s success.